There are many types of chiropractic care. No two people are the same, that’s why at Lakeview Regional Chiropractic Clinic we use a variety methods to treat you. If your car breaks down you explain to a car mechanic what problems you are having with your car. The mechanic also asks you what type of fuel you’re putting in your car. Likewise, your doctor wants to know what kind of problems or discomfort you have been experiencing and how you are fueling your body. Automobile accidents, falls, other traumas or injuries are important information in evaluating your spine and overall health. To further understand the condition of your spine, it is also important to view the structure of your spine through the use of x-ray examination. Your doctor looks for signs of pathology (disease) and fracture; evaluates posture, the joints of the spine, the condition of the disc, subluxations and other conditions of the spine. 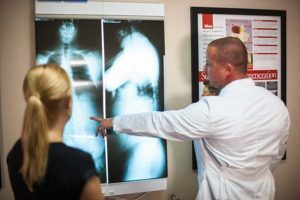 The doctor can also use x-rays to visualize what position the vertebrae are in so that she can adjust the spine as gently, specifically and effectively as possible. Your chiropractor may use an instrument (a Nervoscope, Temposcope or NCM). These instruments, much like a thermometer, measure heat. Abnormal heat distribution is a sign to the doctor that there may be nerve dysfunction and joint swelling in the spine and help the chiropractor evaluate for possible subluxations. This instrument glides down the length of your back and feels like two fingers gliding down either side of your spinal column. Your spine, when subluxated, will send warning signals to your body. Muscles may become tight or tender, tissues damaged from the subluxation or subluxations. To detect the warning signals, chiropractors use static palpation. This simply means that your chiropractor runs his or her fingers over (or palpates) your spine in a static (or stationary) position. Your chiropractor is looking for edema, swelling and tender or tight muscle fibers. Like static palpation, the chiropractor palpates your spine while bending your spine at different angles. The chiropractor determines range of motion, or, how easily or difficult each segment of your spine moves. For example, there may be problems if you can bend further to the left than to the right. Lack of motion is one of the factors in the vertebral subluxation complex. © 2017 Lakeview Regional Chiropractic Clinic. All rights reserved.